We have received below from the SLAM Group who are looking to protect land around School Lane and Manor Road from developers. "As you may know the SLAM group was formed to help protect land around School Lane and Manor Road from developers. The main opposition to this was that they would not be building enough affordable housing but a small percentage compared to large profitable houses. Planning was refused and now the developer, Pennyfarthing, has appealed this decision. 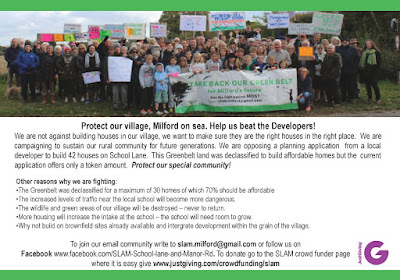 With this in mind we wanted to ensure that the village had a voice at this appeal and we delivered around the village the attached leaflet asking if people wanted to donate to a Crowdfunding site to allow us to employ a planning consultant to ensure we have a voice and who would attend and represent us at the 3 day hearing on the 12th to 14th February in Lymington. In just a few weeks the Crowdfunding site, has raised a total of £2675 - very near our total of £3000. click here to visit funding site. With the majority of money raised we have identified and instructed a planning consultant to represent us. 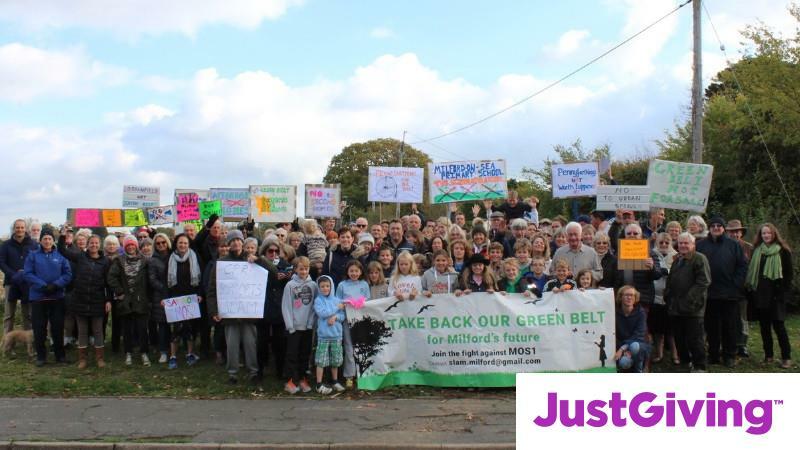 We will be holding a meeting in the community centre on 4th February at 8pm for as many people in the village as possible to attend so we, the SLAM group, can update them on the appeal process in February and also they can meet the planning consultant plus there will be a Q&A session with him. As time will be limited we ask if any questions can be sent in ahead of the meeting - if possible! The whole SLAM team want to thank all of the villagers who have sent letters, already attended meetings and donated to the fund as we wouldnt be in the position without the help and support of the villagers. To donate, please click here."